Hasbro on Friday dropped its lawsuit against Rajat and Jayant Agarwalla, creators of the wildly popular Scrabulous game. Now, please stop saying "Scrabulous." 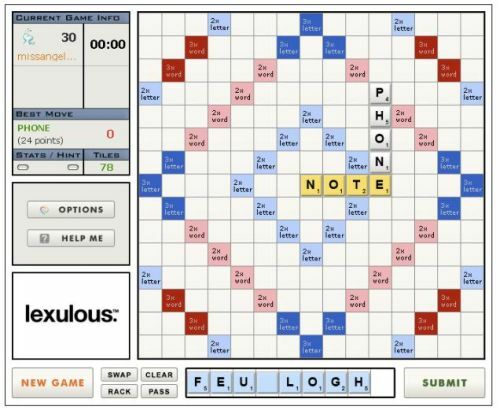 Scrabulous, which the Agarwalla brothers launched as a Scrabble-style game with a superior interface to others they'd seen online, launched in July 2005 and immediately made a major splash among certain Facebook populations, even encouraging some to sign up for the service specifically to play against friends. The trademark-infringement suit -- Hasbro Inc. v. RJ Softwares et al., for those keeping score at home -- was filed on July 24 in New York. According to court documents, the case was voluntarily dismissed at the request of the plaintiffs. Neither the Agarwalla brothers nor Hasbro were available for comment, but a statement posted late Monday on the Lexulous site declared that "Pursuant to the settlement, RJ Softwares has agreed not to use the term Scrabulous and has made changes to the Lexulous and Wordscraper games (in the US and Canada) to distinguish them from the Scrabble crossword game. Based on these modifications Hasbro has agreed to withdraw the litigation filed against RJ Softwares in federal court in New York in July of this year. As modified, the Wordscraper application will continue to be available on Facebook and Lexulous will be available on the Lexulous.com Web site." 11:09 am EST December 3, 2008 - On Tuesday, Jayant Agarwalla, the co-creator of what's now being called Lexulous, told BetaNews that while he's pleased the dispute with Hasbro in North America has been put behind him, Mattel -- which owns the rights to Scrabble throughout the world outside of North America -- continues in its battle against the brothers. Last September, the Agarwallas won their case in the New Delhi High Court stating that they had not infringed upon Mattel's copyright, which applies to India and elsewhere; but Mattel said one week thereafter that it would appeal. Meanwhile, the possibility still exists for Lexulous, or whatever you want to call it, to return to Facebook. "If Facebook allows, we will try our best to provide the game on Facebook as soon as possible," Jayant Agarwalla told BetaNews.